If you are into your beauty products and services, you might be quite familiar with the recent boom that is beauty box subscriptions. Personally, I love them – they are clever little services which hand-pick and select collections of lovely skincare, cosmetics and hair products, all bundled up into a little gift box and dispatched each month. They work by making sure that each month, you receive a set of new products, and one’s you can incorporate into your daily beauty regimes, and to simply try out brands you may not have discovered otherwise. The plus side to them is that a good beauty box service – such as Dollibox which I’ll go into in this post – make sure you get your monies worth, coming out with more than what you pay for. 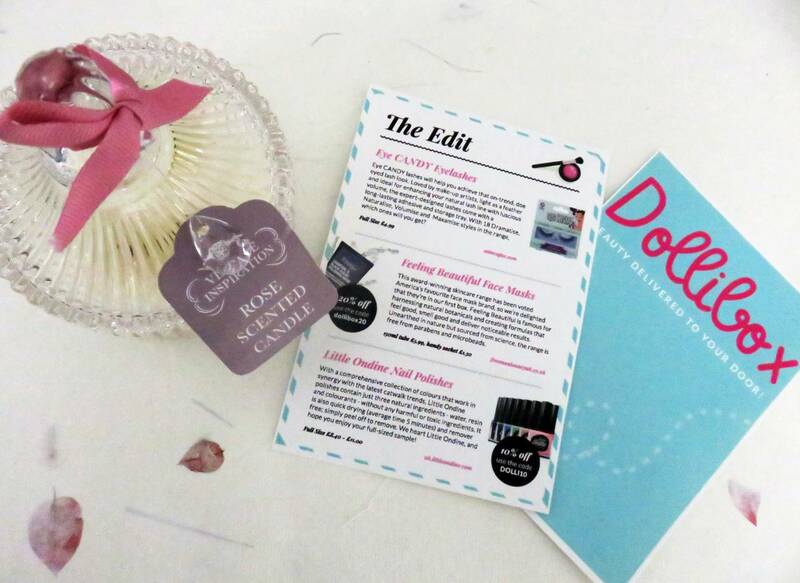 I recently received the October Beauty Box from Dollibox, which costs £10 plus £3.25 postage and packaging if you wish to order on a one-off month basis, which arrived in it’s little pink and white branded box stuffed with 5 luxe beauty items for me to have a little rummage through. The delivery box is super girly, packed with the selected products and super cute Dollibox cards with tips and tricks for using the products, making the box look like the ultimate girly gift. As soon as I opened it, it made me think of my beauty loving friends who would love to receive this as a surprise through their letterbox. So, now we all know how adorable the box looks and how acceptable the price is, the next question is the most important: what is in the box? Ah these are a lovely pair of strip lashes! Such good quality, and don’t have that cheap look or have those hard shiny lashes inserted (you possibly know the one’s I’m trying to describe…). They feel so lightweight, and when applied, blend in with my natural lashes to look subtle. This style in particular are good for adding more texture and depth to the eyelashes, creating a more full and flirty look. They aren’t a dramatic pair, but that is actually what I love about them. Just an easy to apply pair which add fullness and thickness, creating more attention to the eyes. Very happy with these! You can purchase them from here too if you wanted to check them out direct. As soon as I pulled out this face mask sachet, I literally smiled to myself. Its main ingredient is Acai, which was the biggest health trend when I lived over in Australia. Acai berry is a purple palm fruit, praised for it’s cleansing purposes, so it was lovely to come across it in this face mask. I applied the mask to my face after lightly cleansing with face wash, and let it set for 10 minutes in the bath before I washed it off. It was a lovely fruity smell and creamy texture for a clay mask, however still sets quite firm. When I washed this off, it left a really smooth and exfoliated feel, so in general was a pleasure to use. I used just under half the pack on one application, but I was being greedy. You could definitely get three generous applications out of the one sachet! This little nail polish is a lovely discovery because not only does it come in a stunning sparkly grey/black shade, it also has the coolest packaging, and we all know I’m a sucker for quirky packaging. It comes boxed in a little foldable cardboard casing, where the nail polish slides out giving that ‘gifty’ little touch. The colour looks lovely painted on my nails – it’s fairly fast drying and has a thick enough coating therefore two. A new brand I hadn’t come across before, therefore it was a lovely new discovery. This shade I have is called Dark Crystal, and when checked out the brands website I noticed they pride themselves by producing all natural ingredient nail polish, which is also a bonus. The shades are made from natural resin, organic colourants and water. This false tan product is said to be enriched with the magic ingredient of Vegetan Premium to deliver a fast acting and natural tan, delivering a bronzed look in just two hours. I’m actually a huge false tan fan because without it I am literally whiter than white, and I do find I get quite impatient if a false tan takes ages to develop. I usually apply a false tan cream every 2-3 days, and I like to see a golden tan developing by the times it’s been a week. So far, this little bottle of TanTruth seems to be doing the job, and it doubles up as a real luxe moisturiser too as it contains avocado and shea butter. I couldn’t find the price of this product to buy on it’s own as it didn’t tell me on the website, but judging from the quality, I doubt it’s a cheap one, so again, another great discovery in the Dollibox! So overall I am a fan of dry oils, and I literally never have anything negative to say about any argan oils or rosehip oils or any natural oils in general. Dry oils are fantastic for so many practical uses, such as acting as an after sun, a deep conditioning hair oil, clearing up scars and marks, moisturising and even being used as a cuticle oil for nails. This one is just as good as all the others I have raved about in the past; it has a soft citrus type scent and comes in a lovely little glass bottle with a wooden chunky lid, cleverly representing natural beauty even from it’s appearance. It is made with a unique blend of all these hero oils: Argan Oil, Borage Seed Oil, Aloe Vera, Orange Peel Oil, Avocado Oil, Coconut Oil, Sweet Almond Oil, Jojoba seed oil, Rosehip Fruit Oil, Evening Primrose Oil, Macadamia Nut Oil, Hempseed Oil & Olive Oil. A full size bottle costs £24.99 from Tan Organic, so again I think I’ve done pretty well to receive this! In true Emma style, I’ve rounded up this post with a little cheeky selfie wearing the false lashes from Eye Candy. See how subtle they are, yet with that added little bit of volume and length? I purposely took the photo not too close up, so you can get an idea of how they look from looking at my eyes straight on. If you wanted to commit to receiving a Dollibox every month, you can get a 6 month subscription coming in at £9 per box, and 12 months for £8.50 a month. Judging from October’s box, it’s definitely fair to say you get your monies worth in terms of product quality and size. It all depends on how much you like the surprise factor? It could be a nice gift to get a subscription for a friend or family member if you are really struggling, and know they love receiving beauty treats. Check out the Dollibox website for a little more info if you like, and do let me know your personal experiences or opinions on beauty subscription boxes!